Max Payne 3 is the first game in the trilogy that was not created by Remedy Entertainment. Rockstar Games are the folks responsible for the publishing and development of Max's newest romp. Don't worry, the core components that made Max Payne, well, Max Payne remain intact. The terrible puns, the depressing storylines, the action-flick style gunplay and the classic tone are all here. Gone are the odd hallucinations, but Rockstar makes up for that with a dynamic and intriguing set of characters. This is a Max Payne game, that much is certain. But does it live up to Rockstar's recent pedigree of classics? Max Payne 3 is a change of pace for Rockstar. Red Dead Redemption, Grand Theft Auto and L.A. Noire (the lesser of the three in this regard) were all open world games with laxed narratives and rife with opportunities to explore. Max Payne 3 is a tightly wound, chapter-to-chapter, narrative-based shooter. The only opportunities players have to divert from gunplay come when there are small nooks, crannies and rooms to explore. With that in mind, Rockstar elected to hone in on a focused presentation that worked to push users into the experience in front of them, often head first. There are no loading screens once the gameplay starts here. As Max moves from moment to moment, players are ushered forward with motion comic style cutscenes. They happen constantly (sometimes at an annoying rate), and they move with Max narrating over them. The resulting feeling is one that works really, really well. Because of the focused mechanics of progression, Rockstar was able to make Max Payne 3 a more detailed experience. The environments, the animations and the ambiance are all top-notch. The game looks fantastic, and the somber tone of the story oozes out at all points. Does Bullet Time still matter? Would this be Max Payne if Rockstar had elected to ditch Bullet Time? Definitely not. 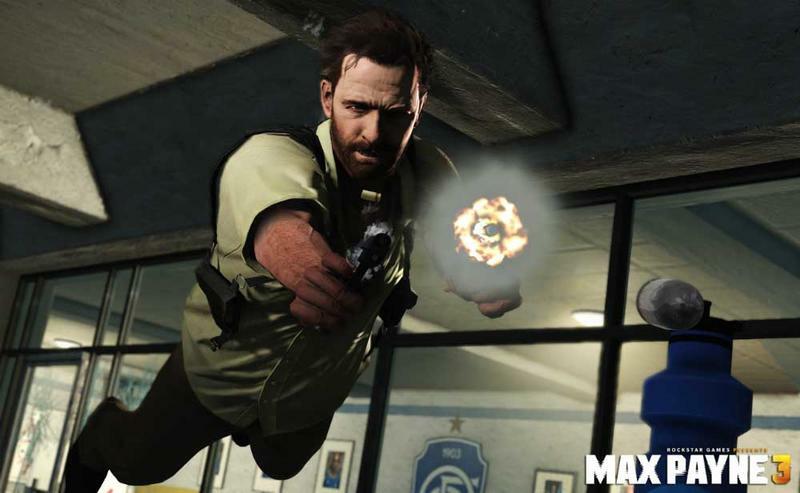 Bullet Time was popularized in the video game world by the original Max Payne. Sure, today it's been made the overused gimmick of action shooters, but it revolutionized gunplay when it was launched by Rockstar and Remedy around a decade ago. Honestly, this is one of the few games that pulls Bullet Time off in a strong way. And, guess what, it's not like we haven't had a Rockstar game do this successful in a long time. Red Dead Redemption had Dead Eye, remember? You could slow time and mark opponents there, too. Max can do the same thing, only Max can Bullet Dodge and recover from certain doom in popcorn-flick style. 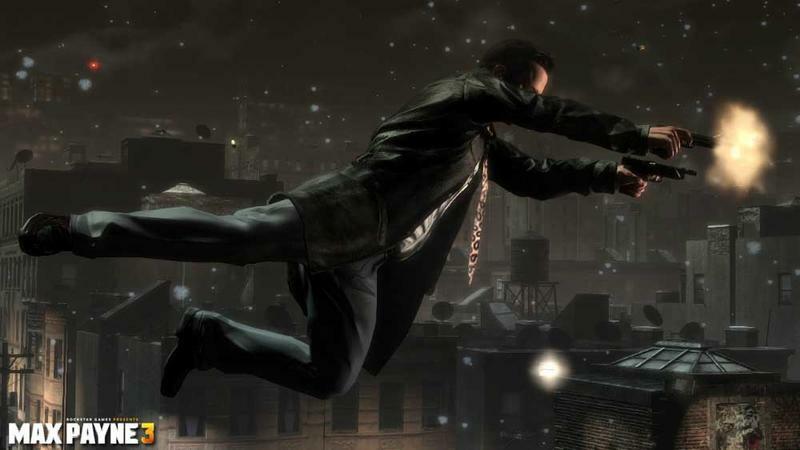 Bullet Time works well for Max Payne 3; that surprised us. While the narrow focus, absence of loading screens and constant voiceover works well to establish a high level of immersion for Max Payne 3, there are a few points that manage to tear you out of the action and remind you that you're playing a game. For starters, and you'll likely notice this problem crop up a ton, the game is incredibly frustrating. It's not that Max Payne 3 is simply hard; the game is hard, and that kind of challenge is welcome in the world of snap-to targeting and instant kills. Max Payne 3 routinely moves from challenging to frustrating. Rockstar managed to regularly pile up bad guys with incredible aim, over-the-top weaponry and a penchant for instantly seeing Max regardless of their current line of sight. That formula makes for an unbalanced fight, except all the time. Ammo is somehow precious in this game. You're Max Payne, a gun-toting ex-cop with the ability to slow time and comment murder on command. You're in an area with an absurd amount of bad guys and guns. Why is it, then, that you're constantly short on ammunition? It happens at the worst times. You'll be in a room with five guys, pinned down behind cover. Click, click, click… Out of ammo. So you're forced to rush head first into one of the enemies and engage in a hand-to-hand moment in order to disarm them. Even better? You run out of ammo right as you've been shot and are entering the quasi-last stand mode. This constant hunt for bullets is problematic. In a game that calls on players to be curators and choreographers of action-flick gunplay, running low on ammo shouldn't be a regular interruption. Bullet Time is rewarding because it creates picturesque moments of combat; running out of stuff to fire during Bullet Time yanks the fun and pleasure out of the moment. The only other big ding we have against this experience is the repetition it delivers. Max Payne 3 is literally gunfight after gunfight after gunfight. Those moments break with some walking, talking or cutscenes, but you're never far from your next shootout. That began to wear us down by the time the story wrapped up. Max Payne 3 is literally gunfight after gunfight after gunfight. Should you buy this dime store angel of death? If you're a gamer who loves tight, well told stories, Max Payne 3 should rest high up on your list of wants. It can be a frustrating ride, but the overall detail, tone and direction of the newest in Max's problems is exceptionally rewarding. That goes double for gamers who loved Max Payne so many years ago. This isn't the same Max. He's still depressed, he still boozes his face off, but he does so with a more polished set of mechanics. Rockstar made Bullet Time fun again, they made gunplay rewarding (when you have bullets) and they made a beautiful world to experience this stuff in. Do you like stories, shooters, depression, Rockstar or the Max Payne brand? If so, this one's for you. We received a review copy of Max Payne 3 from Rockstar Games two days after launch. We completed the title on standard difficulty before starting this review.